These boots will protect paws while your dog explores the great outdoors. Ideal for hunting and hiking as the thick rubberized sole will offer excellent traction on varied terrain, while protecting your dog from abrasive and rocky surfaces and debris. 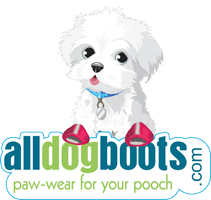 The waterproof nylon material and added bounce rubber ensures your dog's paws will stay dry. They are also great for winter wear in snow or rain and will protect from harsh chemicals and de-icing agents. 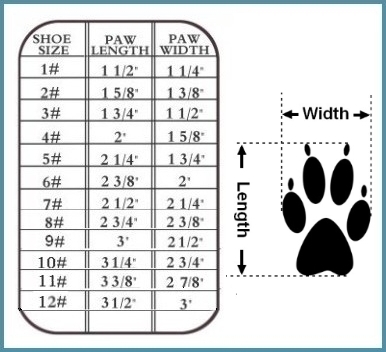 STEP 2: Print the paw print image chart. Have your dog stand on the chart. But for a taller, longer legged pup these are super! 2 velcro tabs to adjust to paw and ankle support is exceptionally helpful. AND the padded bottom helps for those sensitive pads. Again... didn't fit short Tater but would be perfect for a taller pup. We've tried different boots and found these last the longest. The panel in the back is well constructed so the boots don't pull apart - even in heavy wear (climbing in/out of a pond, in the woods, etc.). Dual strap keeps them on firmly. The boots have been great so far! She doesn't seem to mind them and they have stayed on very well. A bit of advice though, put some tape across the straps because Velcro loses it's stickiness in the cold. Other than that, they are working out well! These boots were well made and Im sure they are great for there intended purpose. I bought them thinking they would help my old dog keep his feet under him on our floors. And they did.. but with his arthritis, they were a bit heavy for him to pick up his feet coming up stairs. Im afraid he will hurt himself wearing them. But they work amazingly well at keeping his feet under himself on the floors. I just wish that he could pick his feet up a little higher so that they didnt drag on stairs. I do however highly recommend them for the intended purpose or on a dog without arthritis and the ability to pick his feet up high enough.